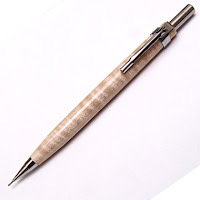 One of the things I've wanted to do ever since I started turning pens was make a Pentel mechanical pencil. The kits out there for making pencils are crap. I've tried a bunch and they've all had serious problems. Some break the lead. Others use a twist mechanism that is too weak to handle a heavy body. And so on. The reliable Pentel pencils I've had over the years have none of those problems. They just work. Repeatedly. For years. 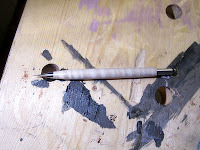 Examining the barrel of a Pentel shows it's a pretty simple design. A plastic tube with a narrow bit at the tip. So why couldn't I make my own barrel? The kit included a stepped drill bit. 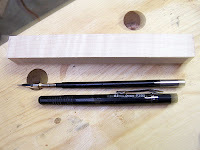 The need for the stepped bit is obvious when you look at the stock Pentel barrel. 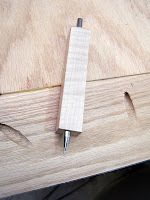 The narrow opening is only at the tip, to allow the nib to be screwed onto the mechanism and bind the barrel in between. That solves the drilling alignment problem. 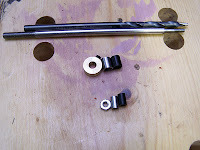 The kit also included a mandrel with a step matching the drill bit. 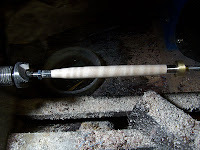 This solves the problem of damaging the blank during turning and allows it to be securely mounted and aligned. 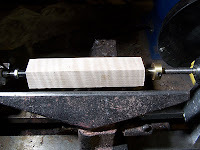 I also got steel bushings for turning to match the hardware, matching delrin bushings for mounted finishing (CA in particular), a nut for the narrow side of the mandrel, and a brass stop bushing for the drill bit. I selected a curly maple blank for my first attempt since I have a bunch. 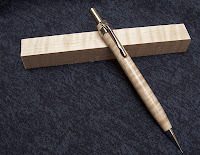 I drilled the blank with the step drill and trimmed the nib end until the nib mounted well. 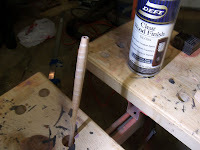 See the photo above for a test fitting. I was half tempted to leave it like that just to be odd! I turned it down to a comfortable shape, if a little heavy. I could have taken it much thinner, but was a bit nervous for my first time. After sanding to 800 grit I removed it and did a test fit. Ahhh... Nice. I applied several coats of rattle-can lacquer (I didn't realize the black bushings were delrin, so I didn't do a CA finish.) After letting it cure overnight I hit it with the buffer and assembled. The pics that follow are how it looked after assembly. Placing the clip was a bit hairy. I was worried about scratching the finish. So I used a drill bit that was a bit larger than the wood barrel to slip the clip on from the top. That worked great! 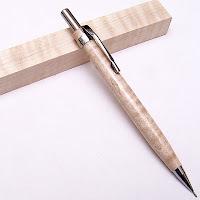 I love how it looks, and that I can now use a mechanical pencil I'm proud to say I made, instead of some plastic (or stainless steel, in the case of my Parker pencil) thing. I will be doing many more I think!